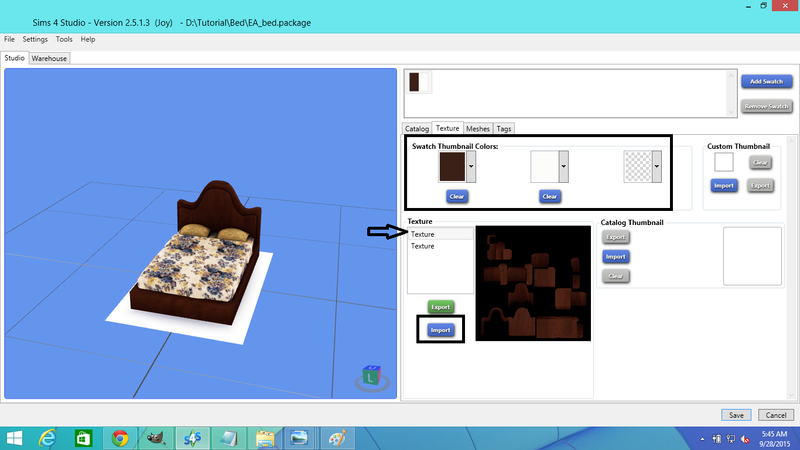 To know the required programs to make Sims 4 cc and to learn how to create the mesh of a cc Sims 4 bed,read Part-1 of this tutorial.Read Part-2 of this tutorial for creating UV map,Map Baking and importing your mesh to Sims 4 Studio. 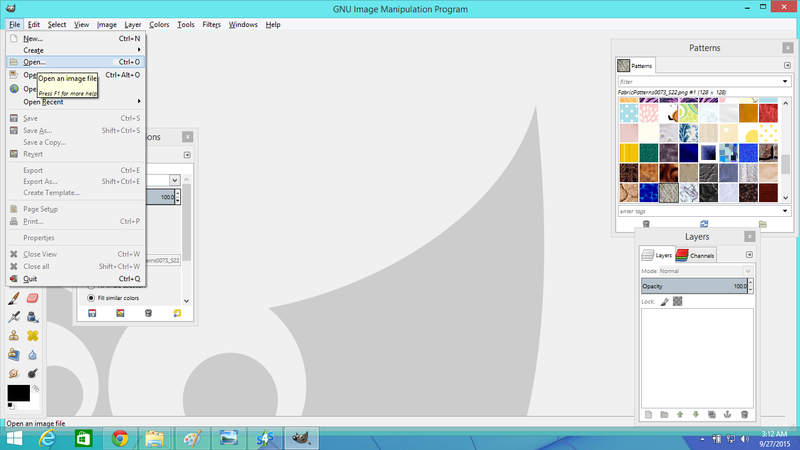 Download the Windows 32-bit binaries and place the extracted dds.exe file in the GIMP plug-in folder, usually located at C:\Program Files\GIMP-2.0\lib\gimp\2.0\plug-ins. 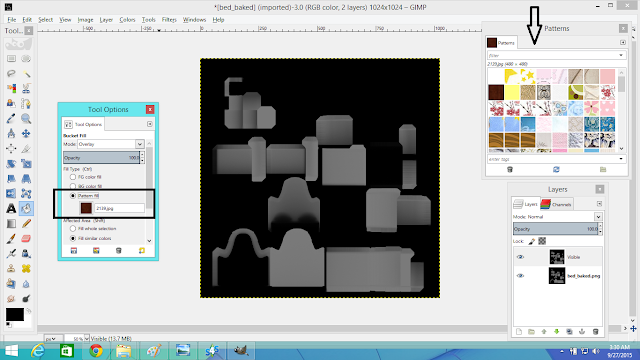 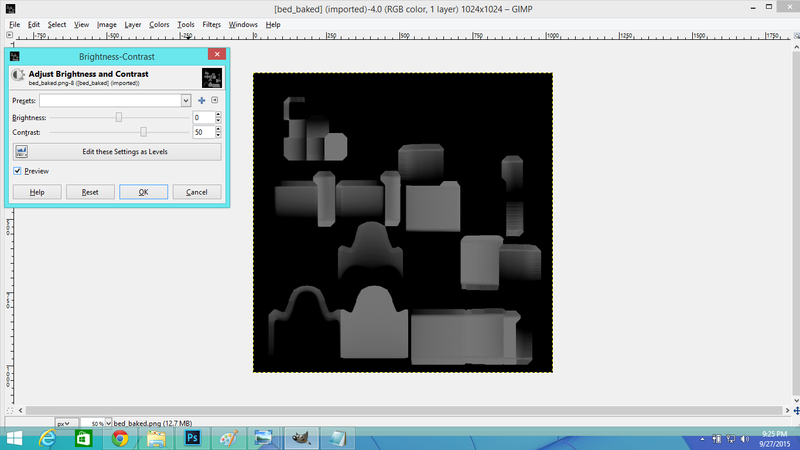 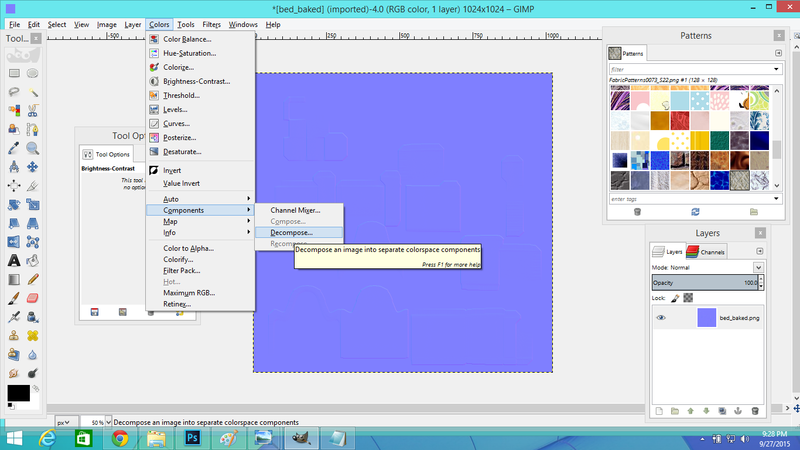 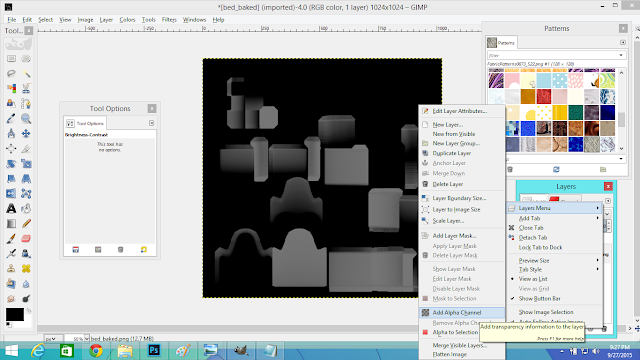 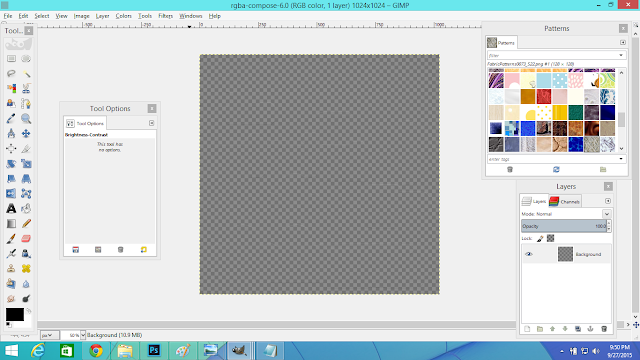 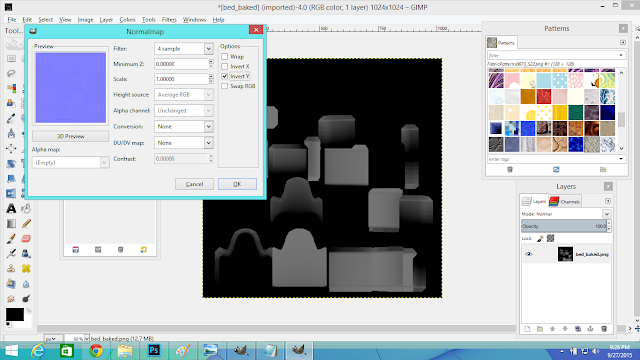 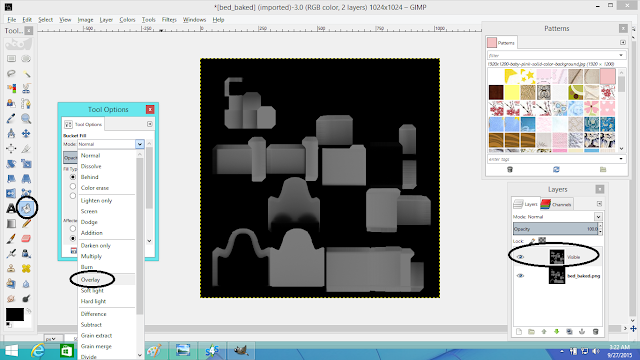 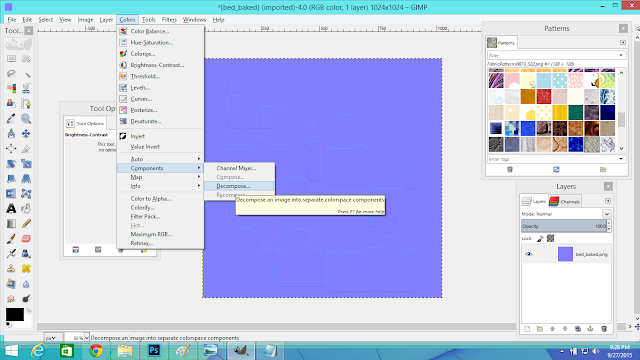 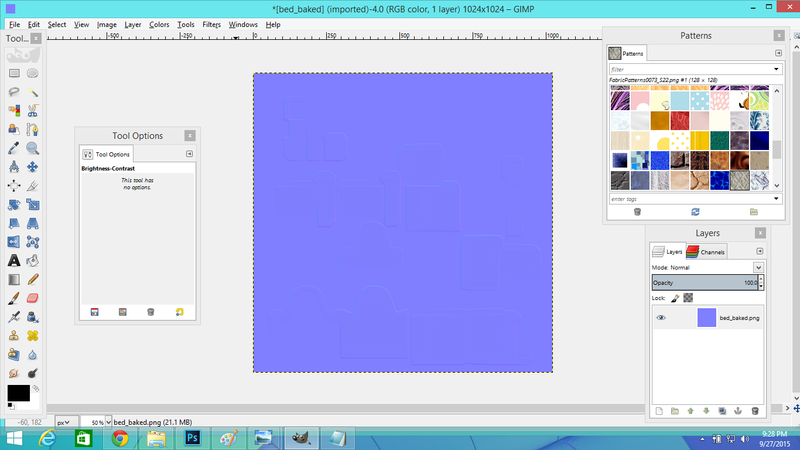 1.Open Gimp and open the image of your baked map that you saved from Blender UV Editor. Now add a new layer to your image as shown below. 2.Select the visible layer and the select the bucket fill tool in the right sidebar,from Tool Options select 'Overlay' as shown below. 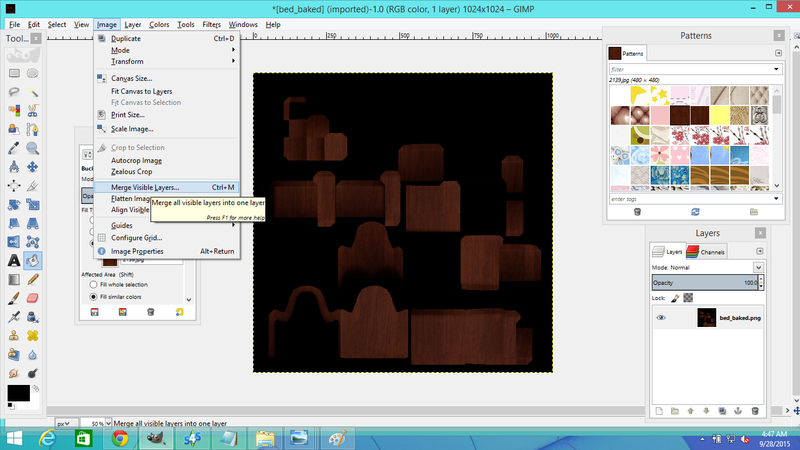 I have downloaded a wooden texture image file from the web and copied it to Users>.gimp-2.8>Patterns folder so that the image appear as a pattern under 'Patterns' window of Gimp.You can google for textures to download and apply them to your objects.For example google for wooden texture and save the image of your choice in Google Image Results.Select 'Pattern Fill' to use pattern as shown below. Set threshold value according to your choice.The higher threshold value will apply pattern to all your parts at once.But what if you want to apply different patterns to different parts of the UV map.For this select a lower threshold value like I selected 33 as threshold value to apply pattern to a individual part of the map for example the part marked by red circle. 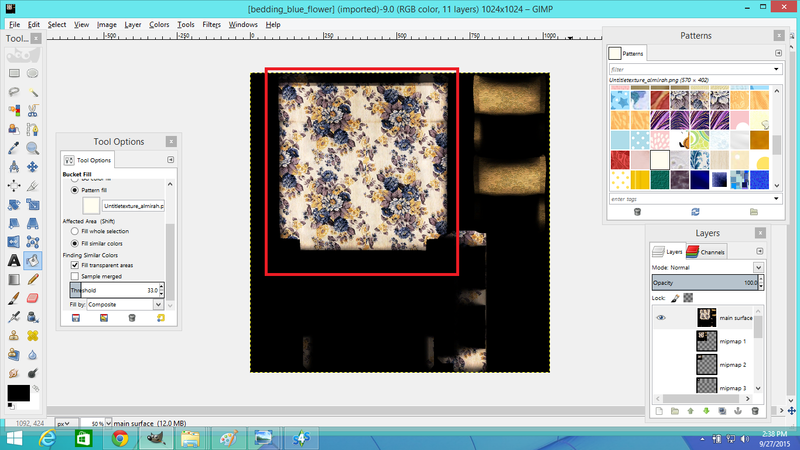 3.Now click on the part you want to apply pattern.Clicking more than once will darken the a dark colored pattern and lighten a light colored pattern.For example you can see my pattern has darken in the 2nd picture below. 4.Repeat step-3 to add patterns to all parts of your UV map.Here is an example of the above UV map fully textured. 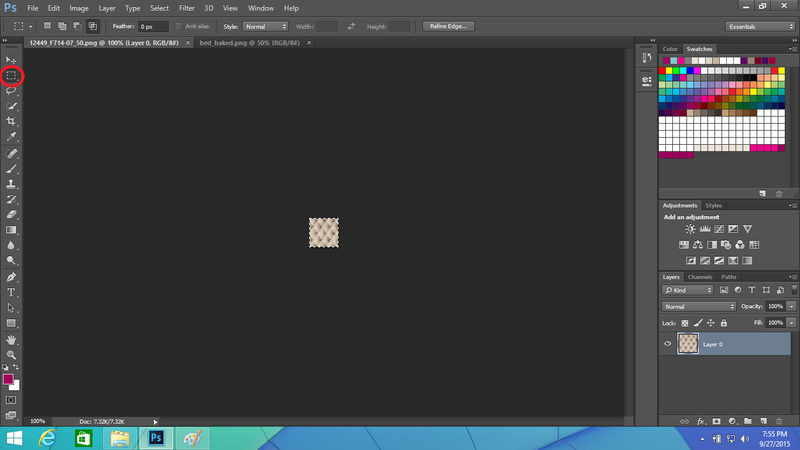 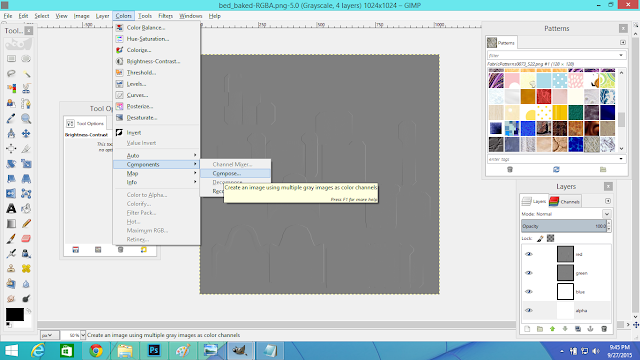 5.Now merge all the visible layer into one layer by clicking on Image>Merge visible layers. 6.We're going to export this textured map for importing it into Sims 4 Studio later.Click on File>Export as. 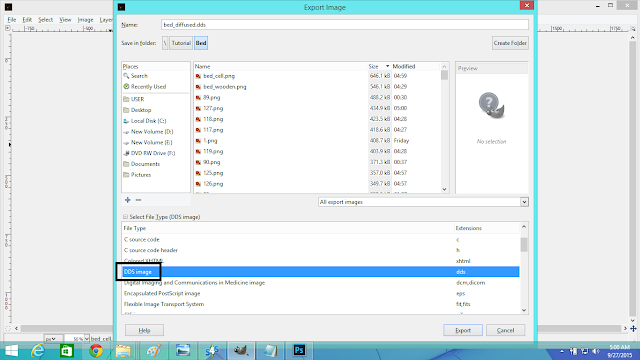 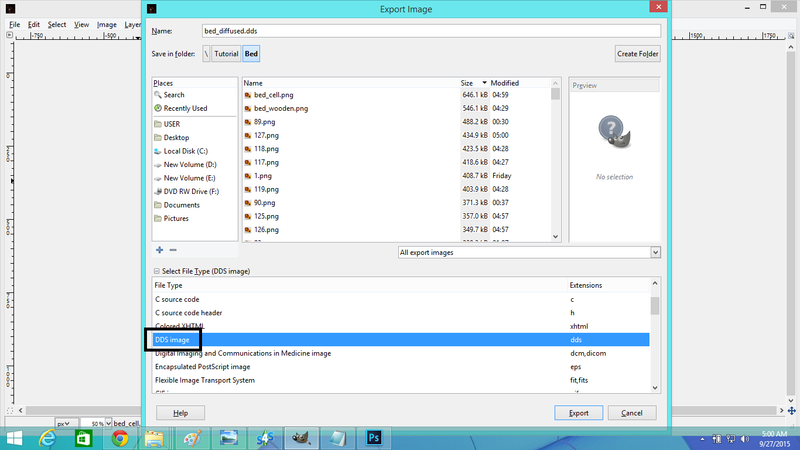 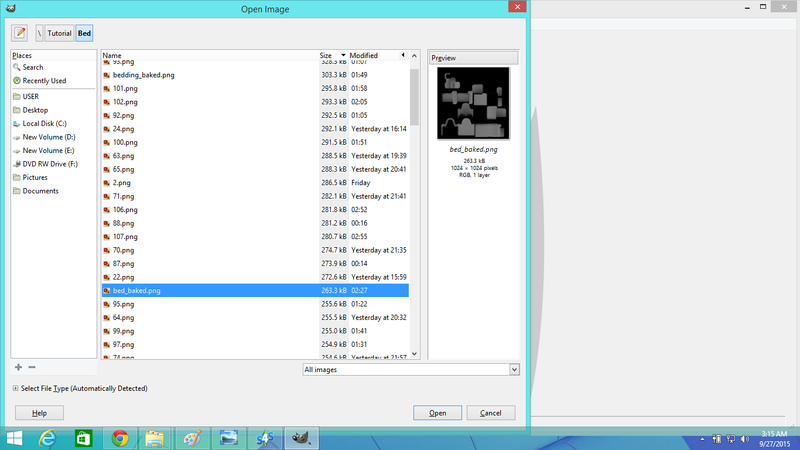 Select DDS image under file type and click Export. 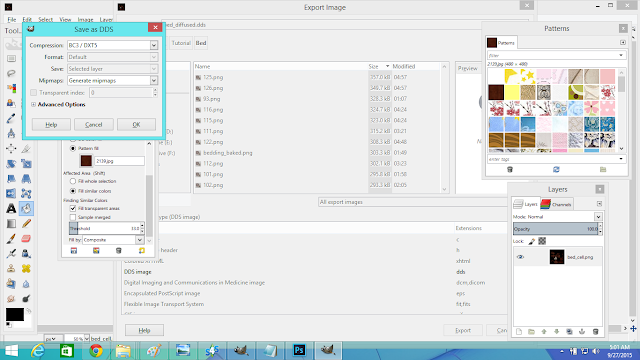 Select BC3/DXT5 as Compression Level and Generate Mipmaps under Mipmaps.Then click 'OK' to export your textured map.It's also our diffused map. 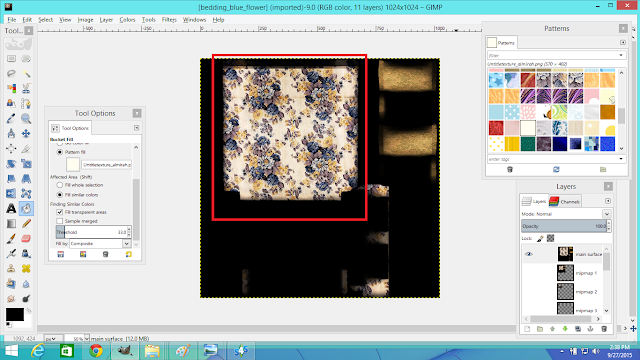 You can see that the bed sheet has seamless texture.I've created the seamless texture In Photoshop CC and then imported it into Gimp.Because if your image file is not a seamless texture itself,you will see break or tiled effect in the final texture if you apply the image to your map in Gimp.I've cropped small parts from the image file I've chosen in Photoshop,then applied them as individual layers and match them like a matching puzzles carefully before I overlaid them on my map.I'm now going to explain this technique below with my the leather upholstery seamless texture I created for the front part of my bed head.The below bed is of my Sims 4 Modern Luxury Bedroom Furniture Set. 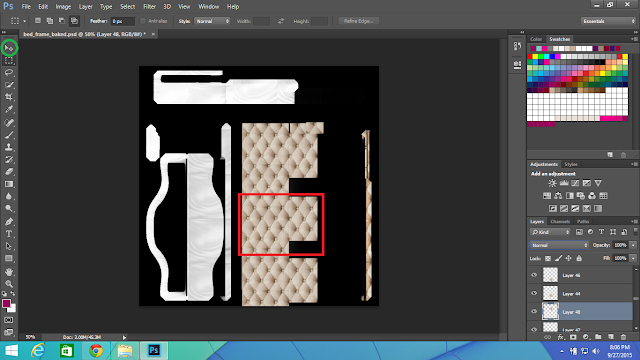 8.Open both the baked map for which you want to create a seamless texture and open the image from which you're going to apply the texture in Photoshop CC.Below I've opened my image file which is re-sized to 200X200 pixel as our bed head is much small than the real life beds.Click on the marquee selection tool on the right sidebar to select any portion or full portion of the image you chosen,then press "Ctrl+C" to copy your selection. 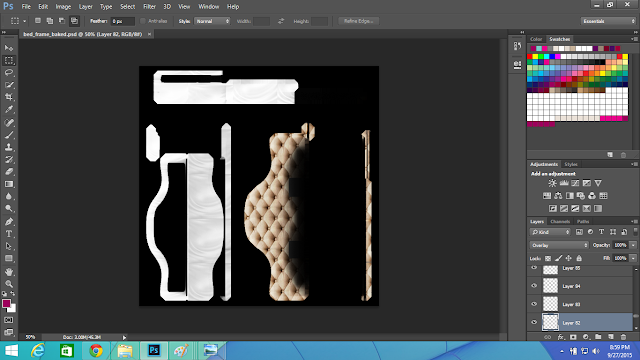 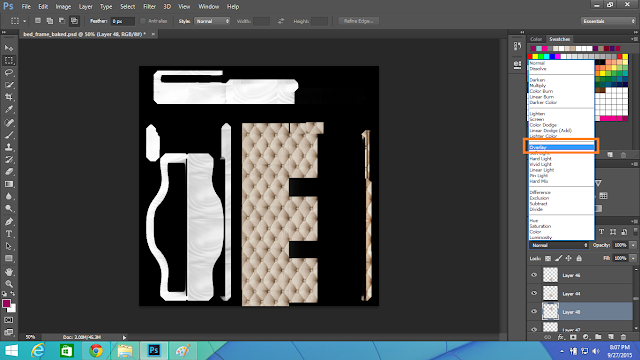 Then go to your baked image opened in Photoshop and press "Ctrl+V" to paste your selection as a new layer.Click on the move tool on the right sidebar to move your image to your part of the UV map.You can see below that I've placed image layer matching to each other to create a seamless texture of leather upholstery.I had created total 82 layers in this map and matched them.That's why I've not shown the texturing of this map from scratch. Select the layers one by one and click on Overlay to overlay them as shown below. You'll see then your layers has been overlaid on your map somewhat like below. 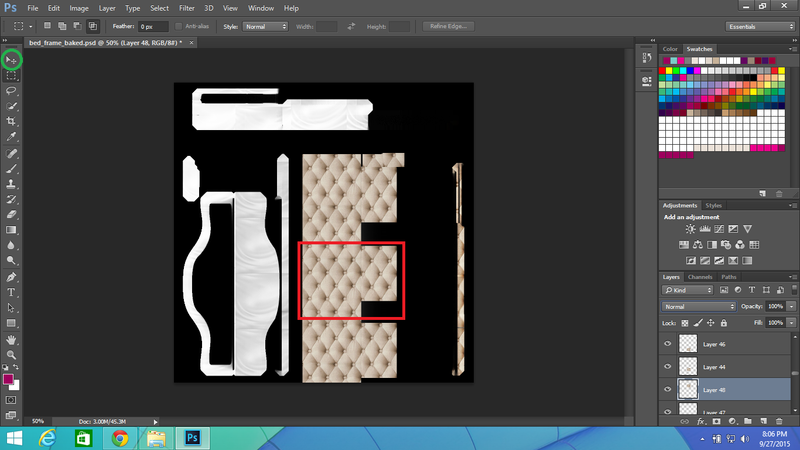 This is the basic process of texturing your map in Photoshop CC.After texturing save your map as .png image,then open in Gimp and export as DDS image from Gimp by following step-6. 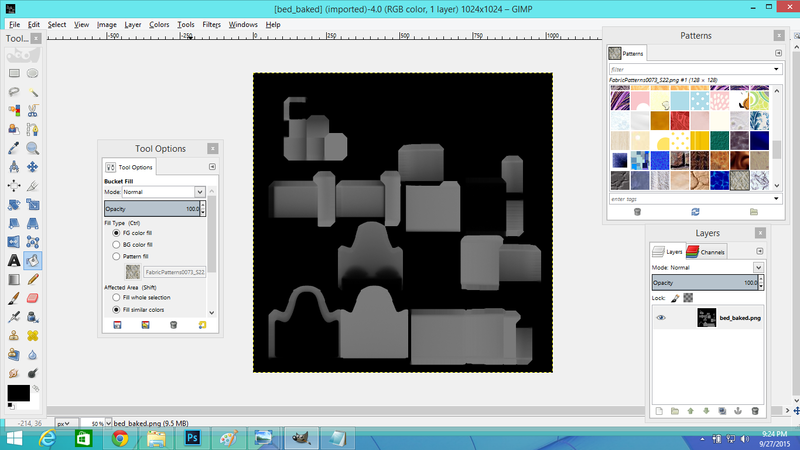 Diffuse map is your textured UV map. Normal map is used to bring a lot more detail onto mesh.Sims 4 required normal map for objects as a mandatory requirement.Follow the steps below to create normal map in Gimp. 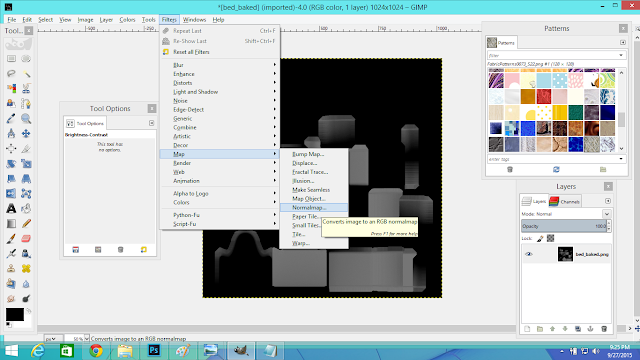 1.Open your baked UV map again in Gimp. Increase the contrast by 30-50% and click OK.
3.Add an Alpha channel to your image from "Configure This Tab" button in Layer Tab. Your map will turn blue like below. 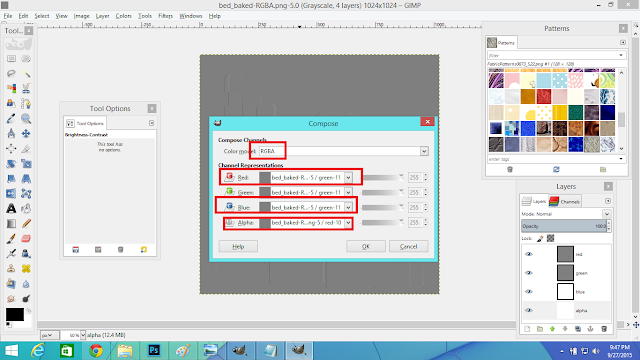 Select RGBA as color model and click OK.
A new window with your map grayed will appear.Click on that window. 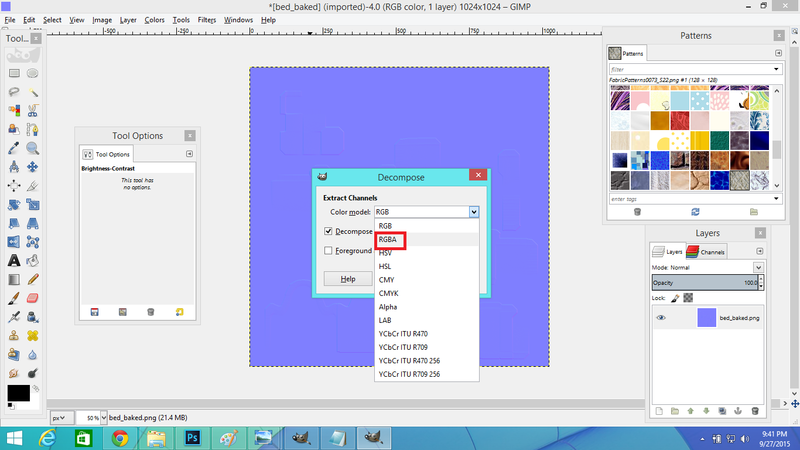 Click Color>Components>Compose from that window. 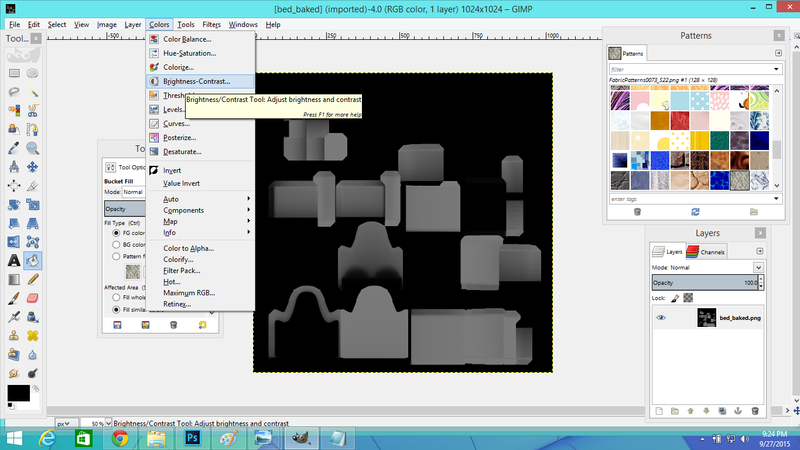 A new window will appear with your map looking like below.Now export this map as DDS DXT5 image like you exported earlier. Kitkat has an excellent tutorial on how to create RGB specular map for Sims 4.Read her tutorial on Sims 4 Studio forum to create RGB specular map out of your baked UV map.Her tutorial uses Photoshop but you can use Gimp to create specular map.Just select channel under channel tab in Gimp when selecting individual channel and click on Image>Brightness-Contrast to increase or decrease the brightness of your selected channel. 1.Open your project that contains your blender meshes of Part-2 of this tutorial in Sims 4 Studio.Then go to texture tab.To import your bed frame texture click on the bed frame texture under Texture window and click Import button.Now in the same way import your bedding texture.To add another texture or swatch,click Add Swatch and import another different color or pattern texture of your bed that you created.You should select colors that are relevant to your texture in Swatch Thumbnail. 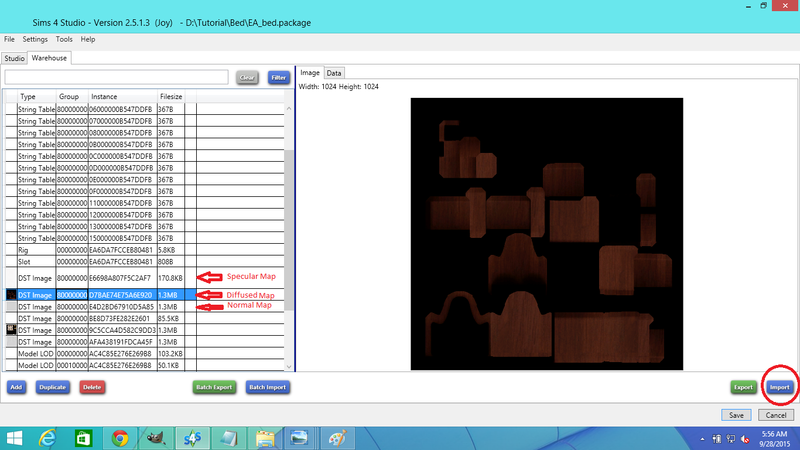 2.Go to Warehouse tab.Your diffused map was automatically added when you imported your first texture both for bed frame and bedding.The Normal Map field is under Diffuse Map and the Specular Map field is above Diffuse Map.Import your Normal and Specular map into their respective filed by clicking on the import button shown below. 2.Save your project.Sims 4 Studio will save your project as package file which we call mod package file or cc file.Copy this file to your My Documents>Electronic Arts>The Sims 4>Mod folder. 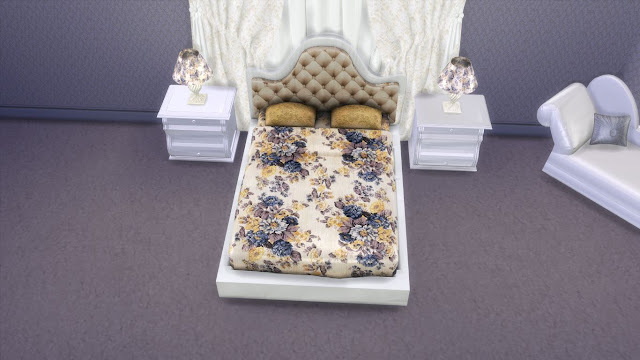 3.Start your game and you'll find your bed in Buy Mode>Comfort>Bed section in game.Below is the tutorial bed installed in Sims 4. 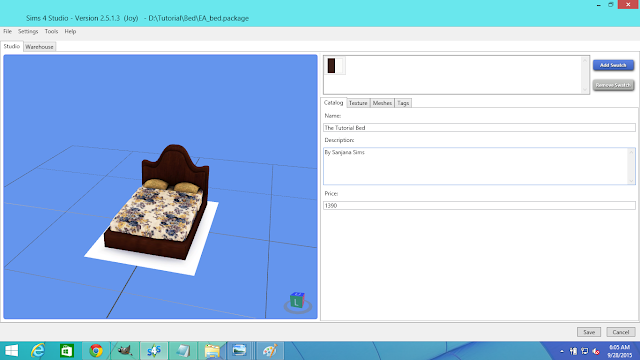 We've now finished creating Sims 4 custom content bed.